Click Home > the Borders arrow . 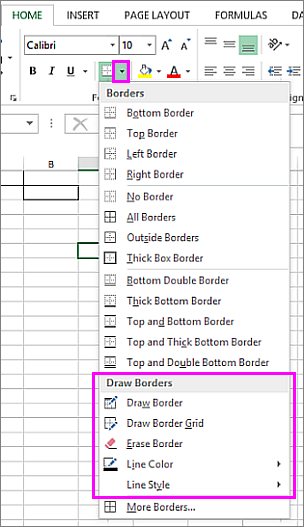 Pick Draw Borders for outer borders or Draw Border Grid for gridlines. Click the Borders arrow > Line Color arrow, and then pick a color. Click the Borders arrow > Line Style arrow, and then pick a line style. Select cells you want to draw borders around. To remove an existing border, click Home > the Borders arrow > Erase Border, and then select the cells with the border you want to erase.